CTUCC: What does tweeting at Annual Meeting accomplish? MACUCC: What does tweeting at Annual Meeting accomplish? For years, attendees of the Massachusetts Conference Annual Meeting have been asked to turn off their phones and other devices so as not to be disruptive. This year, they were given quite the opposite instruction - they were asked to turn ON their smartphones, tablets and laptops and to tweet (post short messages via twitter.com) about the meeting using a particular hashtag (#macucc2012). So, what was the result? Well, about 100 tweets were sent by 20 people during the two-day meeting. The tweets included photos, one-line updates on the business and many quotes from the various speakers. They also included links for more information about various items being discussed. Other tweets shared news bulletins from the meeting - such as Wendy Miller posting: "Unanimous decision to include gender identities and gender expression in our ONA processes. Praise God!" and Jim Antal tweeting: " macucc2012 votes to ratify uGov at national ucc" referring to the ratification of a new unified governance structure at the national setting. 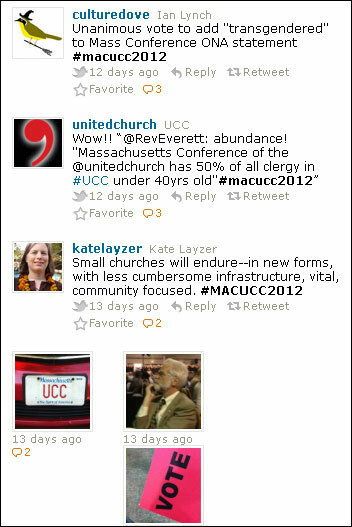 The tweets also allowed for some ecumenical sharing, with Massachusetts Council of Churches Executive Director Laura Everett tweeting a picture of attendees raising their red voting cards, with a caption stating this is what voting looks like in the UCC. She has posted similar pictures from other denominational gatherings she has visited throughout the state. seabreen (Christopher Breen) #MA is the home of 10% of all the Open and Affirming #UCC churches in the Nation! You are welcome here. Even you. leebarstow (Lee Barstow) Jim Antal: Pursuing ecological ministries will bridge denominational divisions. katelayzer (Kate Layzer, quoting Keynote Speaker J. Bennett Guess) All membership organizations are declining. "People don't want to read our resolutions. They want a hammer and some nails." As a former news reporter who has been writing about Conference Annual Meetings for 16 years, I was struck by the fact that these little nuggets that were being tweeted were exactly what I would have jotted down for use in an article (had I not been so preoccupied with other tasks). Seeing those tweets scrolling across the screen of my phone made it seem as if I had a dozen reporters in the room, taking notes for me. What do you think? Is tweeting from Conference events a worthwhile endeavor? Were you at home or at the meeting, following along? If so, what did you take away from the experience?